The project consisted of a new Metrolink commuter train platform and eight bay RTA bus station. 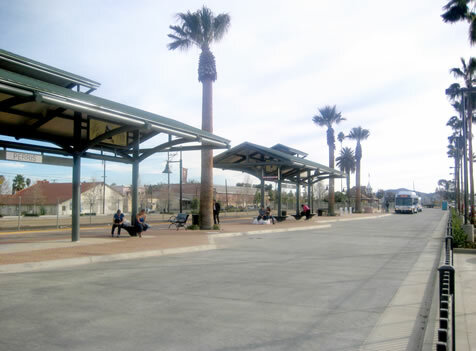 The scope included surface parking lot with landscaping improvements, shelter structures, a state-of-the-art security system, and a railway platform for the future Perris Valley Line (PVL) which Metrolink service is anticipated to commence in 2012. The platform is a 900’ long concrete structure with inlaid concrete pavers and landscaping. It has 5 welded steel shelters which were erected on site. “We had hotlines set-up, but we had no accidents and no complaints from neighbors or commuters for this central and complex project” Grand Opening ceremony quote from Steve Nolan, Mayor of Corona.